This home in Fayette County was blown off its foundation. The National Weather Service confirms a small tornado touched down in northeast Iowa earlier this week. After surveying storm damage on Wednesday, National Weather Service officials say a line of strong-to-severe thunderstorms that moved across the region Monday morning spawned an EF-1 tornado in Fayette County, with winds estimated to be 100 to 110 miles-an-hour. Officials say the 50-yard wide twister touched down southeast of Maynard and was on the ground for nearly six miles before lifting southwest of Arlington. 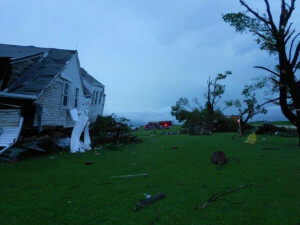 The tornado mainly damaged crops, trees and farm buildings. However, surveyors say the tornado moved a house off its foundation near Maynard, trapping an elderly couple inside. One person was injured. The National Weather Service also surveyed storm damage in Clayton County, but couldn’t confirm the destruction there was caused by a tornado.